Wow, that picture of the Naucean head is great. So they actually have a really small head? Well sorrta, their brains are in the skull behind the eyes as well as partly going down the neck. Think of it as a very think brain stem area. Here is a Copper Age firepit. A Naucean is dancing its procedural dance while the other plays is Naucean horn and pushes up and down on a bellow for the firepit. They have a glowing basket like structure in which the fire pit sits in. The reeds are made of fire resistant reeds that have sticky sap that will not catch fire. Then with the bellows he pushes up and down and makes flames shoot up out of the small top. It is an amazing sight. These are used for ceremonial proposes like this one. The dance they are doing now is thehunting dance in which it tells a story about how they went into the wilderness and hunted down a large gobblehorn and brought it back. They paint their bodies and wave their oral tenticales around while singing and dancing about this. Their voices sound like a cross between a penguin and a whale when they talk and sing. Very nice, very moody with the ligtning. Nice posing too. Lol i love the fact its still their procedural dance aswell. Great picture as usual hydro! Coo. Do they really play the horns with their pseudomandible though? I'd think they'd use their nostrils, what with less loss of airflow and all that. Hmm good point. I was just matching my musician drawing from way before. However i supose that wopuld make sense. *shrugs* whatever your probbly right about that. Wow, your new sig gave me a brilliant idea! Nice work on the last pic btw, though the colour of the light is yellow, so the colour range is limited to that, that should show reflected on the nauceans . Keep working! Is that Idea to have a person/creature walking along, because I also had that Idea. Awsomw work on the Naucean's btw, but why is it against the rules to have animated signatures? Awesome work on the Naucean's BTW, but why is it against the rules to have animated signatures? Because they can get quite annoying, especially if there are a lot of them. Animation can be cool sometimes, but it really shouldn't be in the signature. Fair enough. I know what you mean, actually. 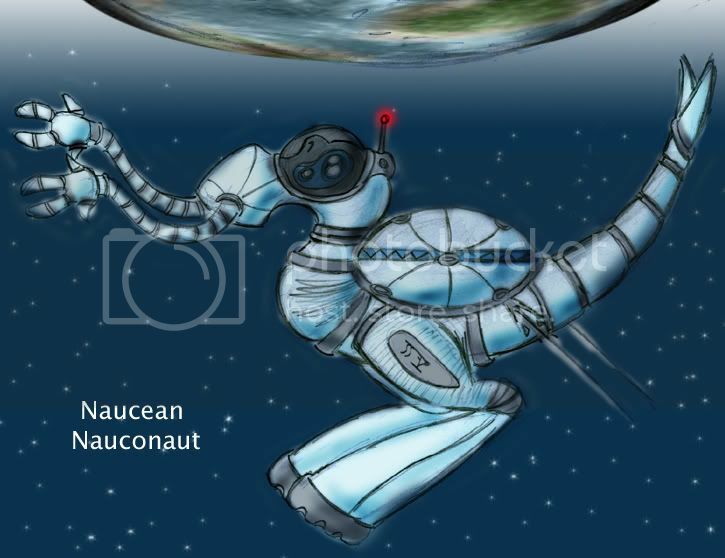 Here is a River Tribe Nauconaut during the Rocket Age. This is during on of the first space walks. The River Tribe may have been first in Space but it is the Cave Tribe which made it first to the smaller moon Sina and the Desert Tribe to the Larger moon Sirenia. Infact all the tribe left (river, grassland, cave, mountain and desert) eventually made it to Space. Things were going well in space too with a space station, satlies, space telescope and even moon bases but all that was put on hold during the robotic age and all space flights were stopped to fight the war.